At its Ubiquity IoT Developer Summit yesterday, Google presented a complete vision of the Internet of Things that consists of open source code and designs that are ready for prototype and pilot projects. Google's version of IoT standards, open source frameworks, and cloud services are compelling, but puts it in a highly competitive market. However, Google's long-term R&D investments in machine learning, cloud, and geo-location technologies uniquely differentiate its vision. If This Then That (ITTT) rule engines have been applied to controlling and integrating IoT devices. A good example of ITTT might be a thermostat instructed to send a push notification to a user if the house temperature drops below 50 degrees during the day when no one is home. ITTT works well for many applications, but its recipes are constrained by the complexity of creating rules for larger and larger systems. Google's open source machine learning project Tensorflow gives developers the tools they need to build large, intelligent IoT networks of sensors to do things like smooth the traffic flow through a city, for example. For more than a decade, Google has invested in outdoor geolocation research to build APIs that developers can use to build geographic position into apps for navigation and geofencing that leverage GPS, Wi-Fi, and cell towers to locate people and things. Google's Eddystone - its open source Bluetooth Low Energy beacon - brings geolocation indoors, increasing the resolution from meters to centimeters either as longitude and latitude or relative scale within the confines of a building. Google has about 20 Eddystone beacon manufacturing partners at this time. Eddystone uses broadcast-only radios operating at a range of frequencies that send small packets of data called frames configured with unique IDs, URLs, or application-specific data. 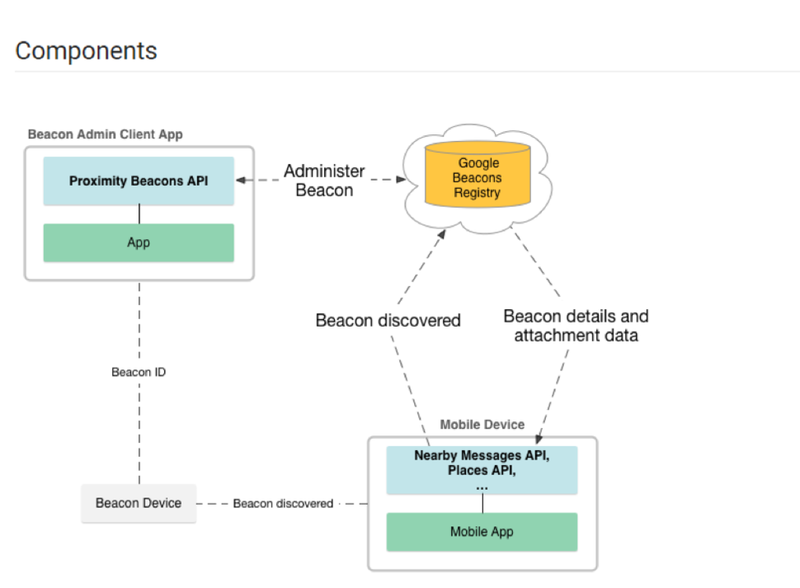 Google will provide a cloud-based registry of information of every Eddystone beacon that app developers can use to store the meaning of each beacon. The plan is to make the cloud registry capable of scaling to manage tens of billions of unique devices with Google's large-scale systems experience and the IoT domain experience of its Nest team. The frame payload and radio frequency can be provisioned, but the devices are broadcast only to eliminate privacy and security concerns. The beacon's identifying payload can be resolved by iOS and Android apps using the cloud registry to learn the beacon's meaning, context, and exact location. Location can be optionally integrated into Google Maps or can remain a relative position in a semantic location graph. A good example is Google's pilot app with the city of Portland, through which they equipped each public transit stop with a beacon, successfully providing real-time transit status within a half-second of the traveler's arrival. Brillo and Weave were announced during the annual worldwide Google Developer Conference last May. 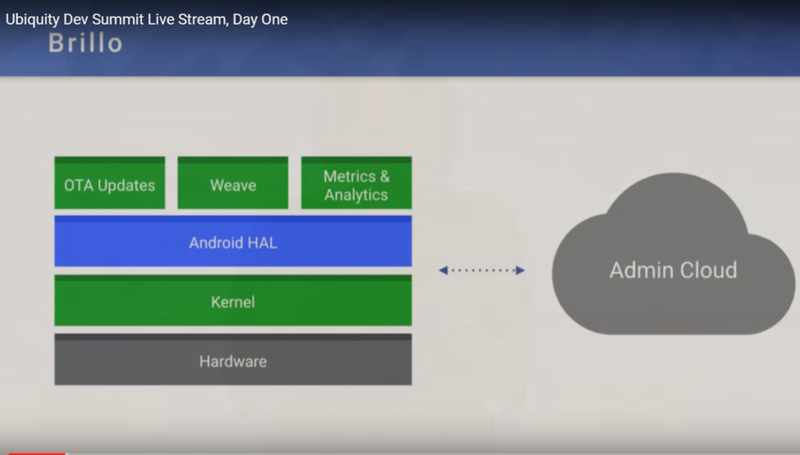 Not surprisingly, Google turned to Android for its IoT operating system Brillo because it already has huge scale and wide hardware support. It is a subset of Android/Linux, which gives Google an ecosystem of development tools, millions of experienced Android developers, and internal and community support infrastructures. IoT manufacturers have flexibility in price-versus-performance design choices because Brillo supports many different silicon device architectures. Brillo follows other IoT architectures by Qualcomm and ARM with a security framework to protect apps from exploits and authorize OS and app updates. Weave is the network architecture designed for low-power, low-speed small packet communications compliant with the early IEEE 802.15.4 standard adopted by chip makers like NXP and Freescale. First specified in 2003 and proved viable by commercial products built with ZigBee and ISA100.11a, it is a stable networking building block that is extended to support the billions of IoT nodes and sensors with 6LoWPAN, which provides IPv6 addressing to huge, pervasive low-power networks. 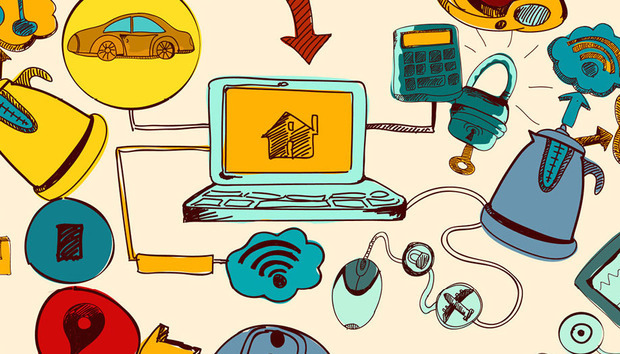 In a call to action for the IoT industry, Google's lead advocate Vint Cerf, also known as one of the “fathers of the Internet,” warned that compatibility, security, and privacy could be obstacles to the IoT's success. Cerf acknowledged the necessity of standards by stating that the IoT can't be built if millions of hubs are needed to interconnect incompatible islands of sensor nodes. He also spoke about the necessity of secure app and operating system updates. Cerf cited an example of the potential privacy threats that could emerge with these billions of sensors. To stress the importance of shared sensor data, he pointed out how first responders could benefit from using location data to rescue a victim trapped in a home fire. But he also acknowledge that criminals could use the same shared sensor data to determine when people are away from home and plan a robbery. The IoT remains at an early stage of development and adoption. Google has open source beacons, networking, an OS, SDKs, and machine learning, all of which enables developers and manufacturers to begin building consumer products. All this open source software will take time to mature, and for developers to learn. There will be some midcourse corrections to strategy and specifications to keep pace with an evolving new industry. The key takeaway from the Ubiquity summit is that Google is the only company with a comprehensive vision with advanced machine learning, geolocation, and cloud technologies to knit all the pieces into the IoT.